HDMI? Who needs it? Sure, it’s currently the best and only way to get the highest quality signal possible running to your HDTV from all your fancy HD home theater components, but it’s not gonna be king of the mountain for long. No, how can a thick cable stand up to a wireless standard that does the same thing? That’s exactly what Israeli company Amimon claims to have developed. They have created a high-def modem that can send uncompressed 720p or 1080i video through walls and up to 40 feet away. This, in theory, will make setting up a high-end home theater easier, although I can’t really see too many ways in which you’d really need to make your TV have a wireless connection to the receiver. Sure, it’ll hide the cables, but otherwise it’s not like you’re gonna be moving those things around all that often. Oh well, progress is progress, right? In conclusion: If you are a videophile with a properly setup viewing room, you should definitely be able to notice the resolution enhancement that 1080p brings. However, if you are an average consumer with a plasma on the far wall of your family room, you are not likely to be sitting close enough to notice any advantage. Check the chart above and use that to make your decision. And remember, the the most important aspects of picture quality are (in order): 1) contrast ratio, 2) color saturation, 3) color accuracy, 4) resolution. 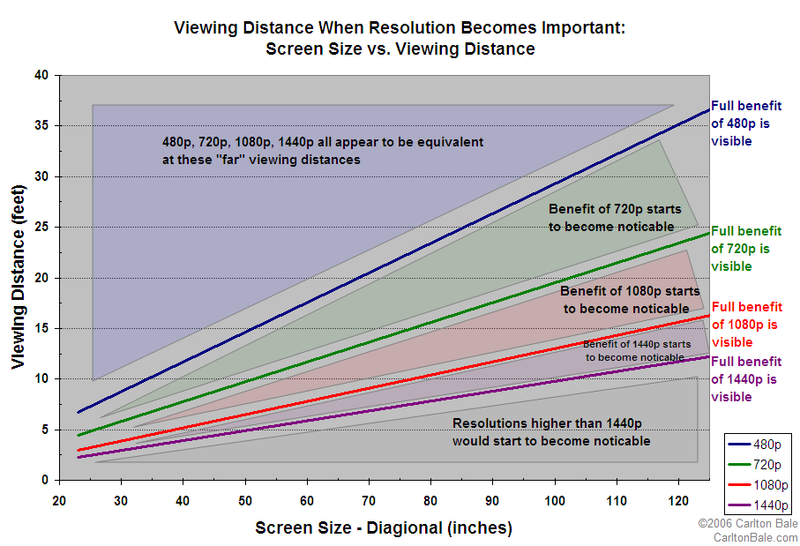 Resolution is 4th on the list and plasma is generally superior to LCD in all of these areas. So pick your display size, then measure your seating distance, and then use the charts above to figure out if you would benefit from the larger screen size. Buying an HDTV may be straightforward if you’re either cheap or have the brain of an eight-year-old, but what if you’re a gamer. Oh wait, you’re already covered with the second option. We kid, we kid. But seriously folks, getting a TV that helps you not get curb-stomped in Gears of War is a different job than buying one that makes Tom Cruise look as good as possible in Mission Impossible. Dean Takahashi of the Mercury News says—after 10 paragraphs that don’t even mention gaming—that the Xbox 360 only has games currently at 720p, whereas the PS3 has about half its games supporting 1080p. He recommends a TV with HDMI for the PS3, but if you have a 360 you’re going to have to go with component. After testing with all of three TVs, two of which were 720p, he recommends you go 720p until 1080p becomes more widespread in gaming. So yes, Dean takes 34 paragraphs to say that you don’t really need a 1080p set, because it’s hard to tell the difference between 1080p and 720p. THANKS! Gamers are totally set for the HDTV revolution now. ~where’s that eye rolling icon when you need it! As you’ll probably know if you’ve been keeping abreast of the latest gaming news over the last couple of weeks, the PlayStation 3 has something of a technical problem concerning high-definition support. 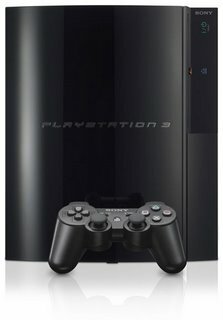 Put simply, on older HD boxes that sometimes don’t support 720p resolutions, the PS3 is currently only offering 480p – which is the same as the current generation of games consoles. Last week Sony promised a patch to fix the problem, but it appears the solution may be more complex; the PS3 not supporting such high-definitinon TVs at a hardware level. Promises of a fix have also subsequently disappeared though the platform holder do assure us they are looking into the problem. More bad news for Sony? Quite possibly, though given this expert’s employer it would be rash to write-off Sony’s chances of satisfying owners of older HD sets, even if at the moment the situation is ambiguous. We’ll keep you posted. If you have a 1080i-capable television (that would be many older HD sets), you may be dismayed to learn that 720p PS3 titles will not upscale to fit the resolution. Instead, 720p titles will always be downsized to 480i or 480p. IGN confirmed this after testing four games — Resistance: Fall of Man, NHL 2K7, Tiger Woods PGA Tour 07, and Need for Speed Carbon — on a 1080i set that did not support 720p; all scaled down to 480p. Take it as you will, whether you prefer 1080i or 480p. Microsoft’s Xbox 360 currently upscales 720p to 1080i if necessary (i.e. 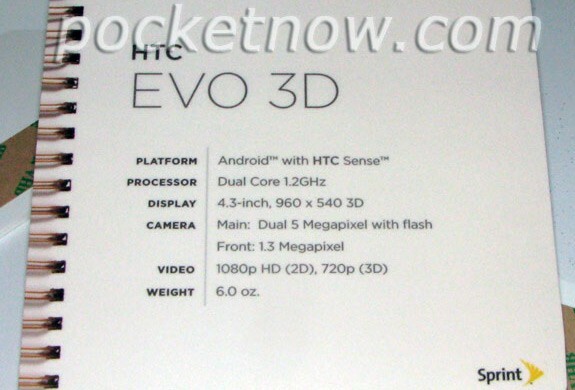 720p is not supported).